National Council on Disability Affairs (NCDA) Director Carmen Reyes-Zubiaga (top right on wheelchair) strongly expresses her appreciation to Taguig City Government and to its developing community in Bonifacio Global City (BGC) for hosting the Freedom Walk 2013. Director Zubiaga said that Taguig City Government can be considered as one of the model Local Government Units (LGUs) for having Persons with Disability Affairs Office (PDAO) created, and developing Bonifacio Global City a PWD Inclusive Community. She appealed to other LGUs to start creating their PDAO so that programs for PWDs will be given more priority. 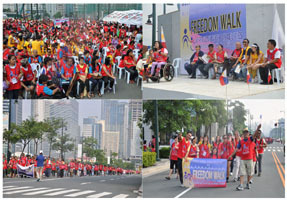 More than 1000 joined the Freedom Walk composed of National Government Agencies (NGAs), LGUs and Disabled People’s Organizations (DPOs). At the back of Director Zubiaga are: (L-R) Captain Oscar J, Taleon, President and lead organizer, Alyansa ng Maykapansang Pinoy (AKAP-Pinoy); Vice-Mayor Ricardo “Ading” Cruz, Jr., Taguig City; Undersecretary Corazon T. Jimenez, Metropolitan Manila Development Authority (MMDA); Mr. Manuel Agcaoili, Chairman, AKAP-Pinoy; Engr. Emerito Rojas, PWD Sectoral Representative of the National Anti-Poverty Commission (NAPC); Ms. Yuli Pesigan, Muse and Mr. Larry Supaz, PDAO Officer, Taguig City. Below photo on the right are the NCDA officers and staff.